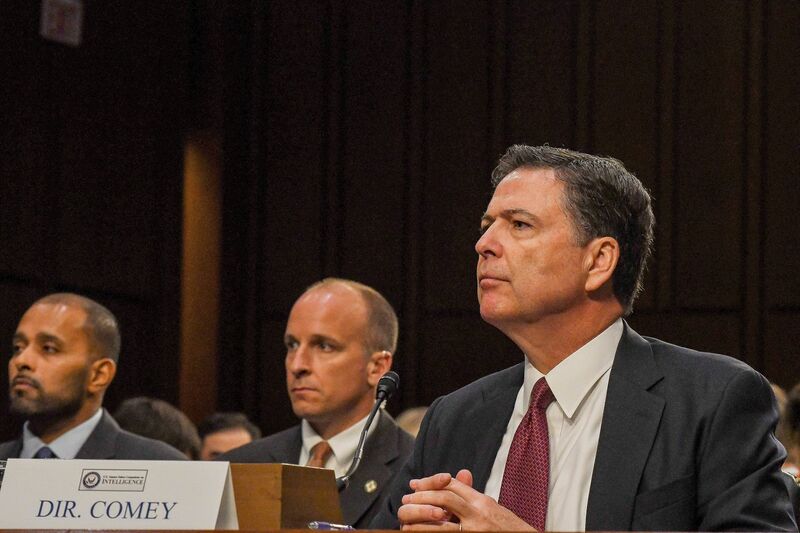 Former FBI Director James Comey’s testimony released Saturday afternoon by House Republicans reveals enormous frustration on the part of lawmakers asking questions, severe memory lapses in Comey’s recollections and raises significant questions about the FBI’s handling of one of the most sensitive law enforcement capabilities to spy on Americans. The 245-page testimony given Friday behind closed-doors to the House Judiciary Committee also revealed through Comey’s testimony that the bureau failed to verify former British spy Christopher Steele’s dossier before submitting it as the bulk of evidence to the Foreign Intelligence Surveillance Court when it obtained a FISA warrant on Carter Page, a volunteer and short term policy advisor for the Trump campaign. Comey said the dossier “was coming to us from a reliable source with a track record, and it’s an important thing when you’re seeking a PC warrant,” in reference to Steele. Steele, who was fired by the FBI for leaking information to the media, was still used as a source by the FBI through Department of Justice official Bruce Ohr. Ohr, demoted numerous times in the DOJ for failing to disclose his connections to Steele, was a back channel for Steele to deliver information to the FBI. Ohr’s wife, Nellie Ohr, worked for the embattled research firm Fusion GPS on the Trump dossier. Fusion GPS hired Steele as part of their ongoing effort to investigate the Trump campaign and any ties with Russia. It was discovered in 2017 that Fusion GPS was being paid by the Hillary Clinton campaign and the Democratic National Committee through the campaign’s law firm Perkins Coie to investigate any alleged ties between Trump and Russia. More importantly, the FBI used information from Steele, a foreign source who was openly antagonistic about Trump. In fact, Ohr told FBI officials that he “was desperate that Donald Trump not get elected and was passionate about him not being president,” as stated in the House Intelligence Committee investigation memo. Rep. Trey Gowdy, R-SC, pushed Comey to answer many of these questions regarding the FBI’s use of Steele as a source and the unverified dossier, which Republican lawmakers and investigators say was the bulk of evidence used to get the warrant on Page. Comey had a difficult time answering simple questions of FBI procedure and how the bureau handles informants. Comey then found himself under a direct line of questioning about Steele’s unverified dossier by Rep. John Ratcliffe, R-TX. Mr. Ratcliffe: Okay. Well, do you recall that, on numerous occasions subsequent to October 21st of 2016, you, in your capacity as the FBI Director, referred to the Steele dossier as salacious and unverified? Mr. Comey. Yes. I don’t know that I was referring to all of it. Maybe I was, but I had in mind some particular portions of it that were salacious and unverified. Mr. Ratcliffe: But, again, your characterization of it was that it was unverified, even though you had verified it to the court? Mr. Comey: Well, it was coming to us from a reliable source with a track record, and it’s an important thing when you’re seeking a PC warrant. But what I understand by verified is we then try to replicate the source information so that it becomes FBI investigation and our conclusions rather than a reliable source’s. That’s what I understand it, the difference to be. And that work wasn’t completed by the time I left in May of 2017, to my knowledge. Comey told lawmakers that the bureau’s investigation into Russian interference in the 2016 election did not begin Steele’s dossier. As for the FISA warrant on Page, Comey admits to Ratcliffe that the dossier was not fully verified by the FBI before the bureau submitted it as evidence to the court and well after he signed off on the first FISA warrant on Page in October, 2016. He noted that the bureau was still in the process of trying to verify the dossier up until May 2017, when he was fired by Trump. Comey’s knowledge of regarding the bureau’s attempts to verify Steele’s sources was stumped with memory lapses. Gowdy had a difficult time getting straight answers from the former director. Mr. Gowdy: When the Bureau uses sources or informants, are there agreements signed? Are there certain obligations on behalf of the source or the informant? Mr. Comey: Yeah, I’m not expert enough to answer that. I’m sure that there are, but I don’t know the particulars. Mr. Gowdy: Is it — would it be unusual for the FBI to tell a source or an informant, you can’t commit any other crimes while you’re working for the Bureau? Mr. Comey: I believe that’s the case. Mr. Gowdy: Would it be unusual for the bureau to tell a source or an informant, you can’t have media contact while you’re working for the bureau? Mr. Comey: I don’t know whether that’s part of the standard warnings or directions to a source. Mr. Gowdy: And you’re not familiar — Mr. Kelley. Excuse me. One second, please. Mr. Comey. Okay, thank you. I’m sorry. Go ahead. Mr. Gowdy. How did Chris Steele’s information reach the FBI? Mr. Comey: I don’t know for sure. I have some recollection that he passed it to an agent that he knew and that that agent sent it on to headquarters. I think that’s the way in which it reached the Counterintelligence Division, but I don’t remember the specifics of that. Mr. Gowdy: How did the Bureau investigate whatever information Steele provided? Mr. Comey: I don’t know in particular. I know that the Counterintelligence Division was investigating various aspects of the reports he had supplied, and that investigation was ongoing when I was fired. Comey is expected to appear again on Dec. 17, before the House Judiciary Committee. To read the full transcript go here.